The Seattle Mariners played a game on Saturday. After the bullpen coughed up the lead and then the game, they got right back on the horse and tried again on Sunday. Saturday's game was played in front of tens of fans in Oakland and was radio only, so the only way to get much information out of it was from the box score. That and listening on the radio, which most fans probably did and ended up having to buy a new radio on Sunday. I'm going to do both games in one post since you can only get so much out of looking at the box score and highlights from the game, and it was a game most of us probably just want to forget. If you've already forgotten, I envy you so much. On a side note, playing the spoiler is something I've brought up a few times over the course of this week. It's nice to try and think that way, but when you go into the ninth inning with a two run lead with Tom Wilhelmsen on the mound and you end up losing 7-4 on a walk off home run in the bottom of the tenth after he gives up the tying, two run shot in the ninth, you may feel the urge to throw your monitor into a wall. Maybe you need some anger management classes. The Mariner and Athletics decided to do us a favor and played the Saturday game early in the afternoon, getting started around 1pm. If Seattle won, we'd have to rest of the day to savor victory. If they lost, we'd have the rest of the day to do whatever it is a person does on a Saturday and forget the game ever happened. Despite the crushing way this game ended, there were bright spots. They weren't exactly bright as the sun type spots, but you take what you can get. Michael Saunders and Kyle Seager each hit a home run in the game, both in the top of the fourth and Saunders with a runner on base. With their respective home runs, they became tied for the team lead with Justin Smoak. With any luck, Saunders or Seager will have hit at least one more home run by game 162 and win the team's home run crown. If we get to the end of the season and Smoak finishes with the most home runs on the team, that would just be depressing. In case you're wondering about where the pitches were that Saunders and Seager hit, I'll show you the pretty pictures you can get from Brooksbaseball.net and their nifty PitchF/X tool. Seager's home run went out to deep center field, meaning he was probably trying to hit it back up the middle and succeeded. When I say he succeeded I mean he crushed it. Saunders took a pitch on the inner part of the plate and pulled it into right field for two runs. There's absolutely nothing to take away from what I just typed, but now you can close your eyes and imagine both players hitting the ball 600 feet because, why not? Aside from two young players showing off their power, the bullpen's ineffectiveness of late was also on display. Consider where Wilhelmsen was just a couple of years ago, I don't think any of us can complain too terribly much. He threw a curveball to Josh Donaldson that stayed up in the zone and Donaldson did what a major league hitter should do with a hanging curve. He swing at it and hit it hard. It was a mistake to a player that you don't watch because he can hit balls a mile. No player can hit a ball a mile, so really you're wasting your time if you sit and watch baseball hoping to see a baseball get hit 5,280 feet. It was a mistake from Wilhelmsen where he hadn't made many of them so far this season. As a matter of fact, he's given up 5 in 78 1/3 innings, in case you were curious. Actually, I guess one huge surprise in this game came from Jason Vargas. The A's have hit many home runs so far this year and Vargas has given up many home runs this year. You combine the two and it looked like it was going to be a messy one for the Mariners. Amazingly, Vargas put together a solid outing, going 7 strong innings while allowing 1 earned run on 5 hits to go along with 0 walks and 7 punch outs. I guess that's more than a solid outing for Vargas, especially when you consider he kept the ball from going over the fence and adding to his total of home runs given up this season. And then the bullpen happened. I don't recall with absolute certainty, but I believe in the bottom of the tenth, Lucas Luetge was warm in the pen and Wedge left Stephen Pryor in to face the left handed hitting Brandon Moss. I don't remember his argument for leaving him in there either, mostly because I just really don't care. If Pryor is ever going to be an eighth inning guy for the Mariners, he can't be a platoon player. It was a test in a lost season to see what he could do against the left hander and he made a mistake. You don't know what you have in a player until he's put into a situation multiple times. The best time to find out isn't in the middle of a pennant chase, the best time is in a season like the one the Mariners are having. I have no issue with the call to leave him in there. The issue I do have is seeing Miguel Olivo's name in the lineup because a left hander is on the mound for the opposing team. You have a guy in John Jaso who has a serious platoon split for his career, with a .270 average against right handers and .164 against lefties. Well yeah, okay, but he's never hit more than 5 home runs in a season before either. We know Olivo can hit the crap out of the ball against left handers when he can actually get the bat on the ball. Why not let Jaso play against lefties anyway to see what he's got? He can't adjust to lefties if he never plays against them. Granted, some guys just plain can't hit left handed pitching, but you don't know until you actually put the guy in against the left hander. For Sunday's game, Seattle had 11 hits. With runners in scoring position, they went a combined 5 for 15 with runners in scoring position after going 1 for their last 397. The 397 is slightly exaggerated, but you get the idea. You see the 11 hits and the 5-15 with RISP and you think wow, they actually scored a few when in fact no, no they did not. The thing about getting hits with runners in scoring position is that when you hit a dribbler to the third baseman with a man on second and you beat it out, it goes in the books as a 1 for 1 with RISP. That's not exactly what happened, but it may as well have been. People forget that with the exception of Coco Crisp, the Oakland outfield looted a pirate ship, lost their throwing arms and had cannons attached in their place. Josh Reddick and Yoenis Cespedes aren't lacking when it comes to their arms. They're not exactly Ichiro Suzuki reincarnated, but the whole cannon thing isn't a massive exaggeration either. All of that to say the Mariners got their hits, but they either didn't dare run on the outfielders or they got thrown out at the plate. Erasmo Ramirez had himself a day. It was an uncharacteristic start for him in that he had 4 walks in his 6 1/3 innings of work. He pitched himself into trouble several times, but generally got himself out of it with pitches that, if I were to guess, giggled as they went by the batter. Ramirez isn't a Taijuan Walker or James Paxton type prospect in that his development is probably already near his peak, but if this is him at his peak and he continues to pitch the way he's pitching...... I have no words for it. I'll put it this way. Imagine a rotation with Felix Hernandez, Taijuan Walker, James Paxton, Erasmo Ramirez and Danny Hultzen. Now do yourself a favor and forget I mentioned that, because prospects are entirely too unpredictable to say this will be the rotation by 2014. One can wish though. Towards the end of the game, matchups were played and matchups failed miserably. 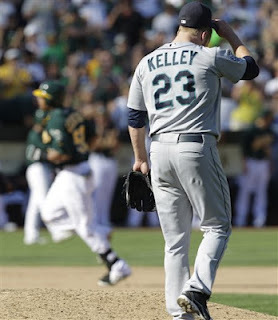 Shawn Kelley gave up the go ahead home run to Yoenis Cespedes in the bottom of the 8th. Next came Lucas Luetge, who gave up a single to Brandon Moss and a two run homer to Josh Reddick. Josh Kinney came in to get the game to the top of the ninth, but by then I had shifted my focus to the grass outside as it grew longer and closer to needing to be cut. As it turns out, the grass was far more exciting than the end of the game. All in all it was two games out of the 162 the Mariners will end up playing that will go down in the Seattle history books as two games out of 162 the Mariners played in 2012. They were disappointing games in that the Mariners lost one late and the other via walk off home run. Neither outcome is very pleasant, but with only 3 games left to play in the season with Seattle out of contention, taking these losses to heart is a fruitless endeavor. Speaking of positives, we assume that the Mariners have seen their offense improve a bit over the last two years, and I hadn't realized just how much until I looked it up two minutes ago. From 2010 through this season's 159 games, their respective home run totals have been 101, 109 and 146. In that same span, their runs per game has gone from 3.2 to 3.4 to this year being 3.8. This has nothing to do with Saturday's game, but I felt compelled to share the information anyway. The final series of the Mariners season starts Monday in Seattle against the playoff hopeful Angels at 7:10pm Pacific. It'll have Felix Hernandez on the mound for Seattle and some guy named C.J. Wilson for the Angels. This will be Felix's last start of the season, so do yourself a favor and tune in. Unless it's bed time, then set your DVR to record it. If it's bed time and you don't have a DVR, you will miss Felix's last start and I feel sorry for you. Not really.